What's Your Monster Hunter Weapon Of Choice? Okay, it happened. I'm hooked on Monster Hunter. I've held off diving into the series for years now, but the latest game, Monster Hunter 4 Ultimate on 3DS, has got me. We just added it to our list of The Best Games for 3DS, and it earned its spot. This game is great. I've been messing around with all the weapons in the game. It's a lot to try to digest, since the weapons are all very different and your weapon choice more or less defines your "class" as you'd know it in any other action-RPG. I've got a long way to go, but that video upped my Sword & Shield game substantially. (X+R)XXAAA(Back + Hold A)! I'm gonna dedicate myself to SNS, at least for now. I know a fair number of our readers are big MH fans, so I thought I'd ask what your weapon(s) of choice might be, and why that's your preference. Gunlance? Charge blade? 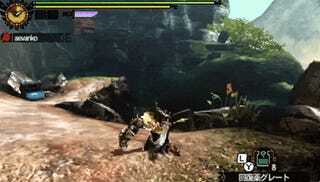 Insect Glaive? Let's hear it!